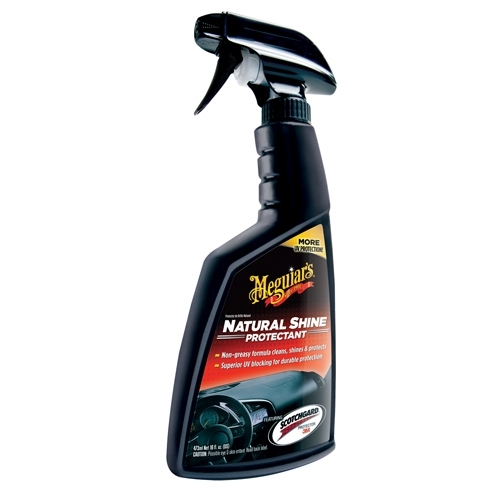 Meguiar's Natural Shine Vinyl & Rubber Protectant Spray - 16 oz. Maintain that "like new" look on dashboards, trim, tires and more. Meguiar's Natural Shine Vinyl & Rubber Protectant's complex formula includes mild cleaning agents that help remove daily dirt and grime and restore the original, natural finish. Includes UV blockers to help reduce the effects caused by the sun. Meguiar's Supreme Shine Protectant Spray - 16 oz. Meguiar's Quik Interior Detailer- 16 oz.